To be honest, I wasn’t quite sure what to expect when I started reading “#Loneliness: The Virus of the Modern Age” by Tony Jeton Selimi. As a psychologist, I have read many self-help books that proclaim to have “the answer” of how to live and think, only to be disappointed. This book does not disappoint. The author provides some great thoughts on how we become isolated, develop low self-esteem and live in a false environment. With all the technology that is available, we have chosen to stop face-to-face communication, using social media and chat groups to deal with not looking at why we feel the way we do. It is easy to be someone we are not when using these media outlets. Many of the author's thoughts remind me of my 13-year-old granddaughter who is on her smartphone a majority of the day and often ignores family. When we ask her to put it down, she becomes angry, defiant and answers queries in one word statements. In fact, both my adult children are the same way. It is sometimes hard to enjoy time around them. The author is very upbeat, and many swear by his TJS Evolutionary Method, which in its basic form includes owning your influence over others, or yourself; listen to your body's wisdom and experience through compassion and acceptance, reconnect with your life's purpose and not what others would have you do, live your dreams, and be true to yourself. There are many examples provided in this book on how one must take a self-inventory and make changes if they want to develop a positive lifestyle. 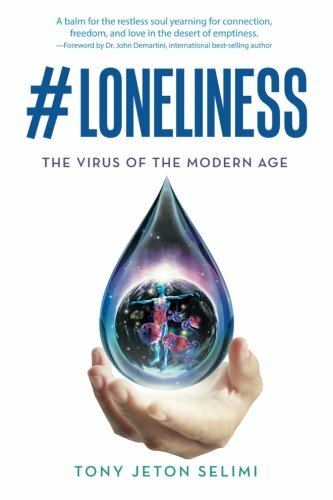 Overall, “#Loneliness: The Virus of the Modern Age” by Tony Jeton Selimi is well written and provides some good suggestions. I would recommend this book to those who are looking for a positive change and seeking to reconnect with the world.